Belfast’s appeal as an international conference destination has been boosted significantly by the recent £29.5 million expansion to Belfast Waterfront. The expanded facility is expected to generate a £100 million return for Belfast over a five year period, with 55,000 additional conference delegates expected in the city by 2020 - double the current number. 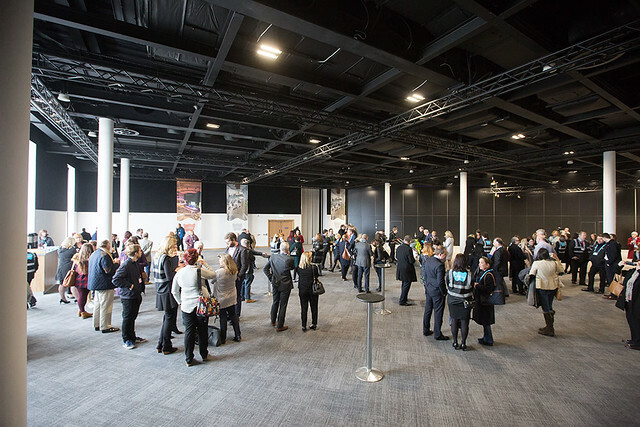 The expansion has transformed Belfast Waterfront into a world-class conference and exhibition facility allowing it to compete more effectively for larger international conferences. This includes 4,000m2 of additional multi-purpose event space (bringing the total space up to 7,000m2). It includes a new 1,805m2 major hall and 702m2 minor hall, plus a range of other flexible rooms. These new event spaces complement the original Waterfront facilities - including the 2,240 seat Main Auditorium and the smaller Studio space. For details of all the event space visit the Belfast Waterfront website. It will complement other Investment Programme projects to improve our infrastructure, including the new Innovation Factory and the Girdwood Hub. The gallery below includes photos of the venue’s opening event in April 2016, as well as the new exterior (taken in March 2016) and interior shots from January 2016, when a special preview of the new space was held for potential customers, event organisers and the media. If you can’t see this gallery, visit www.flickr.com/belfastcitycouncil to view the photos. The expansion costed £29.5 million to build. We committed £11 million towards the development which is the biggest scheme to be delivered as part of our Investment Programme. Funding of £13.3 million was secured from the European Regional Development Fund (ERDF) and £5.24 million from Tourism NI to cover the remaining costs. Please visit the Belfast Waterfront website or call 028 9033 4400 if you'd like more information. This project is part-financed by the European Regional Development Fund, under the European Sustainable Competitiveness Programme for Northern Ireland, and administered by Tourism NI. Tourism NI is the trading name of the Northern Ireland Tourist Board.